Those pesky electric scooters lining the streets of almost every major city in the U.S. are here to stay — whether you like it or not. And ride-hailing company Uber wants in on the fun. 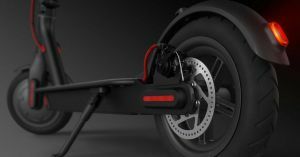 The Information reports that the company is planning a possible “multibillion-dollar” takeover of the popular scooter-sharing startup Bird. Bird may be a big player in the scooter-sharing industry, but it’s not the only one around. Other startups like Lime are trying to make their scooters the ubiquitous choice for those who need a ride home from the train station. In fact, as The Verge points out, Uber already has significantly invested in Lime, not Bird. Since earlier this summer, Uber customers can hail a Lime e-scooter straight from Uber’s ride-hailing app. The news definitely falls in line with Uber’s race to become the ultimate all-in-one transportation provider. Uber has also purchased an electric-bike rental company called Jump Bikes back in April, and has started deploying both Jump e-bikes and scooters in Santa Monica in October. Will Uber be able to secure a takeover of either Bird or Lime by the end of the year as The Information is suggesting? Hard to tell. An acquisition by the de-facto ride-hailing app could turn out to be a pretty lucrative deal to either Bird or Lime. But any company who wants to deploy their scooters at every city corner will have to chose their next move wisely. Scooter-sharing services have already proven highly controversial, especially in cities like San Francisco, where both Bird and Lime scooters are no longer welcome.